Seems to be a plasma to me. I think that is true. What happens when we release a piece of equipment (satellites, spacecraft, boosters etc.) from orbit to "burn-up" in the atmosphere? Is there any data or even a real shot of the process? I`d like to see how that looks like. MGmirkin wrote: Can we replicate rocks exploding in this way by some scaled down experiment (say putting an equivalent rock behind a jet engine or in a blow torch / plasma torch at some experimentally equivalent temperature)? That would be too inaccurate. You have to simulate variating friction of the atmosphere, pressure, change in temperature etc. Its well known that the Shuttle creates plasma around the surface of the leading edge as it re-enters. I think that would be indicitive of the norm and not just peculiar to the Shuttle. A better figure is 30,000+ kph. I wonder what specific observations were able to be made during the time when the craft first came apart. The plasma and its charging/discharging effects on spacecraft have been known about and taken into consideration since the begining of space flight. There is lots of info on the 'Net about this. One thing I was wondering about though was the effect on some of these incoming objects of the earths magnetic field. Metal containing objects travelling at such high speed surely would heat through induction/eddy currents as they passed through the field? It sure would be nice to see some of the information from the military observations, they must have lots of recorded infrared images. Some nice images of a meteor last week over Canada. "I saw this large orb shoot across in an east-southeast direction, on a very steady trajectory," he said. "It was very, very big. And I've seen a lot of shooting stars from all the world as I travelled, but I've never seen one so large. It was very bright yellow, with hints of green in it. It stayed in the air ... for about two to two and a half seconds." Thanks for the vid. Had heard about it but not seen it yet. As noted by others, it appears to repeatedly flash in the latter part of the video. Who's betting on major arcing to the nucleus passing through the Earth's electric field closer and closer to the ground? That video is very cool, indeed. I saw something very much like that in northern California about a dozen years ago, at night, as I drove south on 505 north of Vacaville. 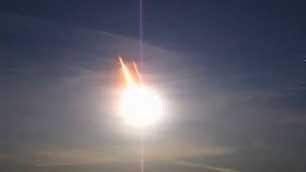 What I saw wasn't as bright as the Canadian object, and its light was far yellower in color; nor was there any flashing or change in the intensity of the light as the meteor (or whatever it was) fell closer to earth. No, strike that—its light did increase as it fell, but wouldn't that be the result of greater friction with the heavier atmosphere at lower altitudes? Mind you, I'm not ruling out an electrical interaction. I just want to keep the options open. The asteroid fragment is now known to have weighed approximately 10 tonnes when it entered the Earth's atmosphere from an energy estimate derived from infrasound records...The indicated energy is approximately one third of a kiloton of TNT," Brown said. "Several of the nearby eye witnesses describe sounds that could actually be from the meteorites falling through the sky, but we don't know that for sure yet. The eye witness descriptions are remarkably consistent with each other as to the location," Hildebrand said. The remarkable consistency of the eyewitness accounts is probably partly explained by the dramatic dust clouds that marked the fireball's path. These clouds remained in the sky without much distortion for several minutes. 'Dust' needs to be glowing to see it in the night sky? Well, you figure with all the light pollution from the city, the dust might reflect at least a little light, yeah? Last edited by keeha on Thu Feb 12, 2009 12:23 am, edited 1 time in total. Last edited by keeha on Thu Feb 12, 2009 12:24 am, edited 1 time in total. I just observed a smaller meteorite just an hour ago. 10:30 PCT appeared to come down over Bellingham Washington viewed from the North. Is that Saturn in the south-southwest? It appeard to come from it (30degrees SSW). Blue-green ball with white core. Perhaps the ball had a 'front' effect that flickered. Yellow 'flames' of material peeling off behind and a tail. I recently saw several nickel-iron meteorites on display at museums in Northern Arizona. Most of these are supposedly fragments of an object that allegedly created Meteor Crater there. The original object is said to have been some 50 meters in diameter. I have three questions about this type of meteorite, and I am hoping that someone on this forum can shed some light for me. 1 - The composition of the fragments was stated to be 90% iron, 9% nickel, and 1% other elements. How could an object this size and composition form in the first place? 2 - Assuming the composition of such an object was the same or similar before it entered our atmosphere, it should be electrically conductive. How would such a large conductive mass interact with plasma and/or electrical fields in space? 3 - Again assuming the composition did not change, it should be attracted to a magnet. How would such a large mass of magnetic material interact with the Earth's magnetic field? I have been puzzling over these questions for several days, but the answers are beyond me -- any feedback would be greatly appreciated. I've lived long enough to see nearly everything I ever believed to be true disproved at least once. 1. I believe Stephen Smith has said in a TPOD a year or two ago that such meteor fragments appear to form from Earth material when megalightning strikes the Earth. Alternatively, the Saturn Theory suggests that comets, asteroids and meteors formed as spills, when planets and moons formed electrically from fissioning of gas giant planets or stars. 2. Such bodies only interact electrically with other bodies with charge differences. If they encounter bodies on different orbits, electrical discharging is more likely. In the case of the Moon and Earth, if the Moon encountered Earth, they might not discharge much, since their charges would be about the same. When spacecraft come down to Earth, there's usually no discharge between them. See the thread on the Columbia disaster. 3. The Earth doesn't seem to be a very strong magnet, so Earth's magnetic attraction may not affect such a body as much as gravity does. Again, metal spacecraft as well as satellites and aircraft don't seem to be strongly attracted to Earth magnetically.